Be the first to share your favorite memory, photo or story of Bernadine. This memorial page is dedicated for family, friends and future generations to celebrate the life of their loved one. 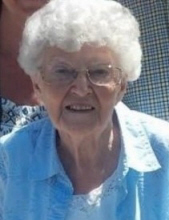 Bernadine Barbara Misiak, 92, passed away peacefully on November 30, 2016 after a short illness, surrounded by her family. Bernadine was born on May 16, 1924 in Chicago, Illinois. She and her husband Tony raised their four children in the Chicago area, and lived in Wonder Lake, Illinois until 1978 when Tony retired and they moved to Phoenix, Arizona. She and Tony were married for 53 years until Tony’s death in 1998. Bernadine enjoyed spending time with her friends and family, playing cards, going to the casino, and watching sports on TV. She was happy to witness the Cubs win the World Series. Bernadine is survived by her sons Paul, of Phoenix, and Mark, of Wonder Lake, Illinois, daughter Pat (Steve) Leska, of Phoenix, and son Jim (Mary) of Peoria, Arizona. She is also survived by her three grandchildren Marie Leska, Brian Leska, and McKenna Martyniak, extended family, and many friends. She will be greatly missed and will be remembered for her generosity to help others in need. A public viewing and Rosary will be held at Heritage Funeral Chapel 6830 W. Thunderbird in Peoria on Monday, December 5, 2016 from 5:00pm-8:00pm. A funeral Mass will be held at Our Lady of the Valley 3220 W. Greenway Rd. Phoenix on Tuesday, December 6, 2016 at 11:00am. There will be a private family gathering to place her in her final resting place, right next to Tony. To send flowers or a remembrance gift to the family of Bernadine Barbara Misiak, please visit our Tribute Store. "Email Address" would like to share the life celebration of Bernadine Barbara Misiak. Click on the "link" to go to share a favorite memory or leave a condolence message for the family.